As the biggest game in program history�looms with BCS #4 Boise State,�the community is rallying behind their Wolf Pack*. Of the many events planned for the week, the changing of the “Biggest Little City” sign may be the most visible. 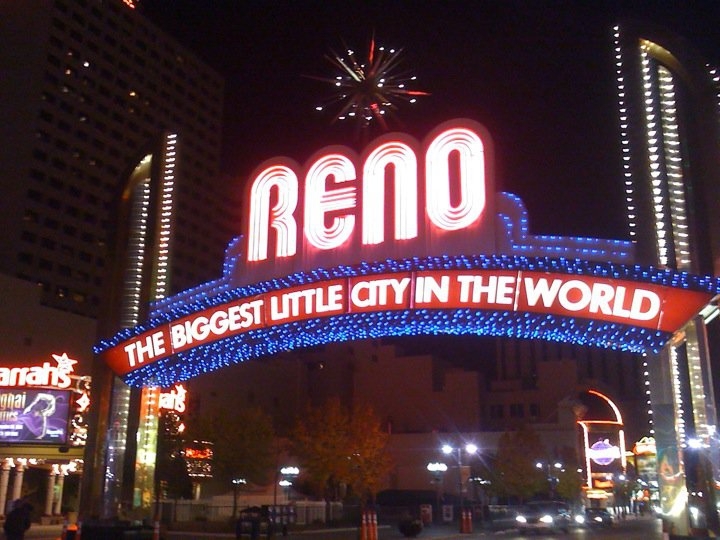 The City of Reno purchased new “Nevada” blue lightbulbs that were installed for a ceremony on November 22nd. The city has also asked the downtown casinos to put up their blue lights, similar to the lights used for the NCAA tournament Sweet Sixteen run in 2004. Game time is set for 7:15 pm on Friday at Mackay Stadium. The game is sold out from the ticket office but there are some seats available through StubHub between $120 and $150 per ticket. If you can’t find a ticket, the game will be broadcast on ESPN. Below is a list of scheduled events to support the Pack before the game. November 26th University of Nevada Alumni Tailgate: 5:00 pm at Legacy Hall $10 for alumni $15 for non alumni. Includes all you can eat buffet. On behalf of fellow alumni and fans… GO PACK!!! *Unless you live in North Carolina the correct spelling is “Wolf Pack”. Posted in Local Events, News.